1. The upside down house debt is erased in most cases. If you are selling because of a financial hardship, then the upside down house debt will be automatically erased in most cases. If your loan is owned or insured by the following agencies: Fannie Mae, Freddie Mac, FHA, USDA, and/or VA; their policies state that your short sale debt will be erased completely. 2. You are eligible to buy another home much sooner compared to a foreclosure. The most common loan programs, Fannie Mae and FHA, stipulate that you can buy another home under their programs in about 2 to 3 years. 3. Short Sale is at NO Cost To You. That is right. A short sale costs you nothing. ALL the selling expenses are paid by your lender. That includes the title insurance, attorney fees, agent commissions, and back taxes. 4. Your credit suffers much less much less damage. Many people think that a short sale will be the kiss of death to their credit. The opposite is true. That is the one big advantage of a short sale over a foreclosure. And your credit rebounds much more quickly with a short sale versus foreclosure. The other benefit is that you will have less debt. (More debt hurts your credit score.) You will have a lower debt to income ratio, which could actually boost your credit scores. Within a couple of years or less, your credit will be back to normal or even higher than before you short sold, and now you can even buy another home if you want. 5. Employment factors. Some employers will not hire employees with a foreclosure and other credit issues. Further, retention of employment can be threatened with a foreclosure. For those with security clearance, they cannot have a foreclosure on their record. Short sales typically bypass these issues. 6. You avoid the humiliation of a foreclosure. Neighbors know when foreclosure occurs. Not so with a short sale. With short sale, your listing looks like all the other normal seller listings in the neighborhood. 7. You don’t have to pay rent or make payments during the short sale process. Most short sales take 3 to 12 months to complete. Most people do not make mortgage payments during the short sale process (but do continue to live the house). You can use that savings of not having to make house payments or rent payments to relieve other financial pressures in your life. 8. You will likely qualify for some type of cash at closing incentive. These cash incentives range from $2,000 to as high as $30,000 and are being paid by Lenders, the U.S. Treasury (HAFA), and FHA (HUD) to Short Sale your home (versus be foreclosed on). You can use this money you receive at closing for moving and relocation costs (or to just get back on your financial feet). That’s where we come in. As distressed property and short sale specialists we are expert in homeowners’ options and all the stages of foreclosure. That’s our business. Helping families avoid foreclosure helps everybody: you, your family and your community. The secret to avoiding foreclosure is simple. Get started now. The sooner we help you understand your options, the better. The sooner we begin work with your particular situation, the better. The worst mistake is letting time run out. 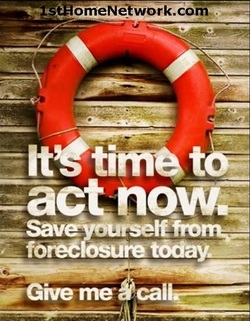 Get started now…and let us show you all your options to avoid foreclosure.